Last week, we talked about discovering the essence of our character. Relatedly, over the past few days, several thoughts rolled around my head that made me wonder about the essence of our story. Or to put it another way: What makes a story idea the one we want to tell? For any story seed, premise, or theme—such as “a character faces the consequences of mistakes they made years ago”—we could come up with countless ways to explore that idea. We could use almost any genre, setting, character, plot, or story to express that idea. Yet during the process of brainstorming, drafting, and revisions, we slowly discover the specific details of our story. The details that make our story unique. The details that make us excited to share our story. The details that we’d balk at changing. Those details—the ones we’re passionate about—might give us clues about our story’s essence. Let’s take a look at three perspectives for identifying our story’s essence—as well as why understanding our story’s essence matters. What Does “the Story We Want to Tell” Mean? If we’ve ever let anyone read our work, we’ve probably received conflicting feedback. Understanding the reasons people might react differently to our story can help us know which advice to prioritize, but even with just one source of feedback, advice can still be in conflict…with our vision for the story. I’ve seen editors who want to change the premise(! ), tone (from dark to slapstick! ), or whole plot(!). Those are all major changes—not just from a rewriting perspective, but also from a “feel”-of-the-story perspective. would it still feel like our story? Anything that brings us closer to the story we want to tell is valuable, but we’re the only one who knows what we were trying to write. We’re the only one who can tell our story. Do you know your story's essence? Here are 3 insights that might help... Click To TweetSometimes their advice wouldn’t necessarily make the book better. It would just make the book different. There are many perspectives and definitions for grasping a story’s “essence.” Some might say our story’s theme or message. Others might say the premise. Still others might say it’s the combination of both of those along with the characters. Knowing what sorts of changes we could make before it no longer feels like our story—the story we want to tell—helps us see what the essence of our story is…to us. How Does Our Story Reflect Us and Our Worldview? Tangible elements like premise, plot, or characters can make our story unique in the eyes of readers. However, from our perspective as an author, our story is ours because it’s a part of us and we’re a part of it—it reflects us. That connection—that understanding of how our story is ours—is another way of looking at our story’s essence. While much of ourselves is in our writing through inspiration from life events or conversations, one of the biggest ways we connect to our story’s essence is through our worldview. “Our view of the world—optimistic or pessimistic, God does or doesn’t exist, true love is possible or not, people are basically good or selfish, technology will help us or kill us, etc.—is so deeply a part of us that we might not consciously recognize it as a construct of our mind. If the thought of changing an aspect of our story feels like a betrayal to our essence, that might shed light on the connection between our worldview and our story’s essence. What Impression Do We Want to Create? For any aspect of our story, we can struggle with getting our thoughts onto the page. That difficulty is compounded with the less-tangible aspects of our story, such as our story’s essence. Regardless, we probably won’t be able to create a coherent impression for the reader unless we know what we want that impression to be. Once we know, we’ll be better able to come up with the right events, actions, behaviors, reactions, internalizations, hints, subtext, phrases, and words to create that impression. From a story essence perspective, that means we’ll have a better chance of creating the impression we want if we know the story we want to tell. But how does the impression we want to create relate to our story’s essence? What aspects of our story should feel so fundamental that readers would never question our choices? Why Does It Matter If We Understand Our Story’s Essence? But there’s a deeper benefit to gaining insight into the story we want to tell, and it has to do with the concept of narrative. What Narrative Are We Creating with Our Story? The Hamilton musical’s final turning point features the song “Who Lives, Who Dies, Who Tells Your Story”. The lyrics emphasize that someone creates every narrative we hear, and those narratives create legacies. How can understanding our story's essence help us create the right impression for our readers? Click To TweetIn the song, Hamilton’s wife Eliza (who lived for 50 years after Hamilton’s death in the famous duel with Burr) points out that her efforts to gather stories and documents about her husband are responsible for his story being told at all. Without her, Hamilton’s early death would have erased his legacy, despite his “Founding Father” status. Similarly, this past Monday (MLK Day), Martin Luther King Jr’s daughter, Bernice, recognized her mother’s influence as the architect of his legacy. Without Coretta Scott King’s pushing for her husband’s influence to spread across the globe, MLK and his ideas, speeches, and beliefs would be a footnote. Every day, we see how the media and our choices of the media sources to listen to (or the curation of our social media contacts) creates our understanding of current events through the narratives we’re exposed to. A few years ago, Ana Mardoll did a live, 14-post-long reading of Prairie Fires, a biography of Laura Ingalls Wilder (of Little House on the Prairie fame) by Caroline Fraser. The biography (and Ana’s read of it) explores how Wilder’s books deeply influenced the pioneer mythology of the U.S. and yet weren’t nearly as factual as most readers believed. As widely read stories, their narratives helped shape the country’s beliefs about self-determination, individualism, “bootstraps,” etc. into a legacy that still ripples today—all despite the narratives being wildly misleading. In other words, the narratives we create with our stories are important. No, we’re not likely to write a book as widely read as Wilder’s books, but every story still puts a narrative out into the world that influences thoughts, beliefs, and attitudes. 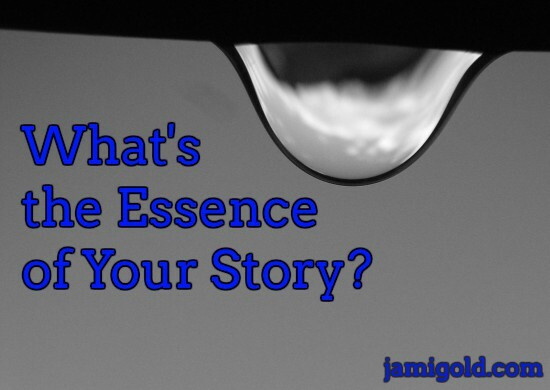 Have you thought about or identified your story’s essence? Do these insights help you see your story from a different perspective? Do any of these insights resonate with you or your understanding of your story? If you know your story’s essence, has that knowledge helped you in any way? Do you know what narrative your story contributes to the world? When Does It Make Sense to Make Big Revisions? I’m struggling with my current novel, to the point I’m not sure *what* story I want to tell. Is that parent dead or does she die during this book? What if I change that, but don’t change something else? My head is spinning from all the choices. Ugh!